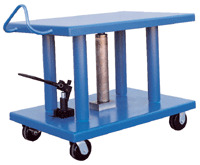 Foot-operated hydraulic post lift tables are built for heay duty shop use such as lifting dies and castings, moving machine parts, positioning welder's work, leveling feed material for pump presses, conveyors and press brakes, and similar material handling jobs. Posts are telescoping to help stabilize and support loads during operation. DC units (Pic. 5) include a 12V DC electric motor to raise and lower the platform. They also include a battery and hand control on an 8 foot coil cord. The 200, 300 and 500 lbs. capacity units include four swivel (two with total-lock brakes). The 1000 lbs. 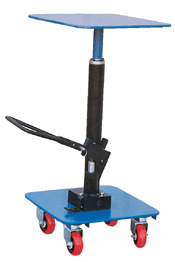 and higher capacity nits include two rigid and two swivel casters with wheel brakes. Light Duty models (Pic. 2, 3, 4) feature a single-speed foot pump. Heavy Duty units (Pic. 1) feature a two-speed foot pump for maximum operator convenience. 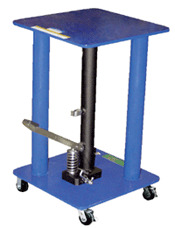 All foot pumps include a down speed control valve for safe platform lowering. Model V-HT-02-1616 (Pic. 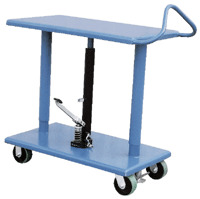 2) includes a rubber-coated platform that swivels 360 degrees for use as a turntable. 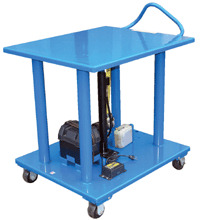 Low profile & Short Pump Lift Range Available. AC, DC or Air/Oil Available. Contact ZORIN @ (888) 378-6525.